For more than a century Dippy the Diplodocus, the much-loved 26-metre long dinosaur skeleton held centre stage at the Natural History Museum in London, captivating generations of children. However, after 112 years as the museum’s best-known prize exhibit, the country’s most famous diplodocus was replaced by the skeleton of a young blue whale who died in 1891, around 152 million years after Dippy’s demise. 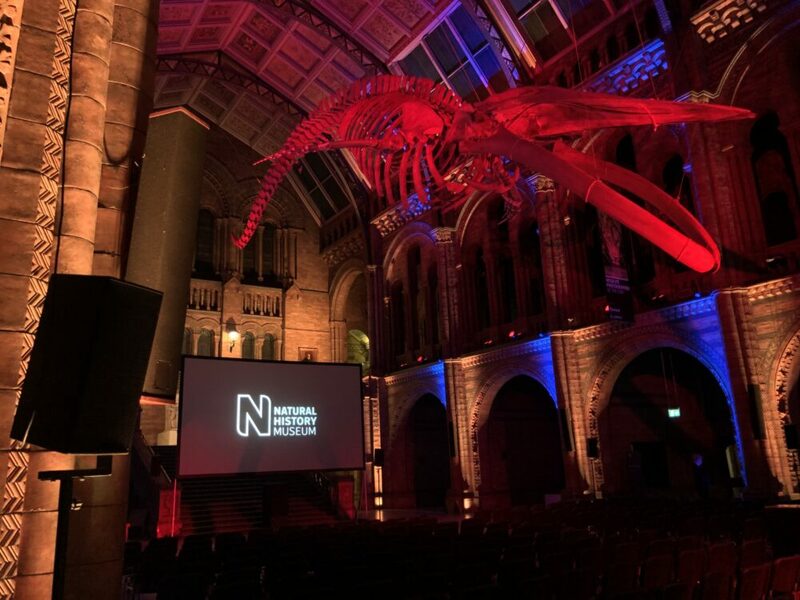 To celebrate the arrival of the blue whale and to launch The Natural History Museums new feature exhibit, Summer Screens was commissioned to convert the world famous Hintze Hall into a cinema, providing state of the art projection and audio for the event. 500 guests per night sat beneath the illuminated skeleton to watch a series of sea-based films, culminating in the sold-out screening of Steven Spielberg’s masterpiece Jaws. The event proved so popular that the Natural History Museum has continued to work with Summer Screens on a further five seasons of films covering topics such as space, the natural world and most recently a season of romantic films for valentine’s day.